Are you looking for a state government job? You have a lot of opportunities waiting for you. 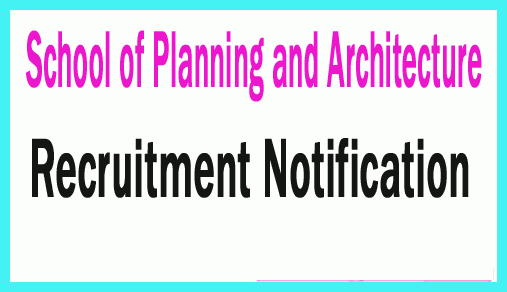 SPA Delhi Assistant Professor Recruitment 2019 (School of planning and architecture) has announced its recruitment for the filling the vacancy of 47 posts for the post of Assistant professor. The postings are available various kinds of a department. The names of the departments are clearly in the given information. SPA Delhi Jobs 2019 has hired with the educational qualification of Bachelor’s Degree in Architecture or Master’s Degree from the recognized University. The candidates have to go through the eligibility criteria such as educational qualifications pay scale, important dates, age limit, important links and how to apply, etc are mentioned in the official websites. The application forms for these postings are available now on the website. The pay scales for these postings are completely based upon the completion of the degree. The salary package for U.G., P.G., and Ph.D. candidates are mentioned in the given below information. Before going to apply for this post, the candidates must thoroughly go these instructions. The age criteria for these postings are not mentioned on this website. The mode of application for these postings are online, initially, the candidates have to download the application form from online. The needed information should be filled as per your original certificates. The candidates have to submit their application form on or before June 10, 2019. If they asked any photocopies regarding your certificates means, you have to be attached along with your application form. Step 1: If the candidates are interested to apply the SPA Delhi Recruitment 2019, you have to visit the official website such as www.spa.ac.in. Step 2: You have to go through this website and click on the needed posts. Initially, you have to check the eligibility criteria for the required post. Step 3: If you do not satisfy the eligibility criteria means, the candidates have not able to apply for these posts. If you satisfy these eligibility criteria, you have to precede the further process. Step 4: you have to download the application form and fill all the details as per your original details. If any of the details get varied from your originals, you will not able to attend the interview. Step 5: While filling the application form, the format should be prescribed as per the official website. Before going to send your application form, you have to attach the scanned photographs of your certificate. Step 6: the candidates have to give the valid contact number and E-mail id. Moreover, you have to check all the details and pay the application fee for recruitment 2019. Step 7: the candidates have to submit the application form on or before June 10, 2019.